In today's modern digital world, more and more employees work from a location that is remote from where Elvis Server is installed: people are working from home, companies have offices in multiple locations and staff is employed from anywhere around the world. Each of these employees connects to Elvis over the Internet and because of the way the Internet works, this connection is routed over multiple servers in multiple parts of the world. The further away from the Elvis installation therefore, the longer the route and the slower the connection is. Amazon CloudFront resolves this problem by providing a direct connection between two Amazon points: one that is close to Elvis Server to connect to and one that is close to the user to connect to. This results in the shortest possible route and thereby in higher connection speeds compared to regular Internet connections. Figure: Comparison between a typical Internet connection running via multiple servers versus a direct connection offered by Amazon CloudFront. Amazon CloudFront can make use of local caching at each Amazon connection point (known as 'Edge locations'). However, Elvis Server does not make use of these cached files; all files are obtained directly from the server. In this scenario, a Photoshop file of 254Mb was checked-out. 1 The connection was capped to 50Mbit; the improvement could potentially be higher. Please be aware that certain limitations exist on CloudFront, such as a maximum file size for each request. For more information, see the 'Limits' article on Amazon.com. Not all locations will see a performance improvement when using CloudFront. Typically, the speed improvement will be most noticeable for those users that are furthest away. 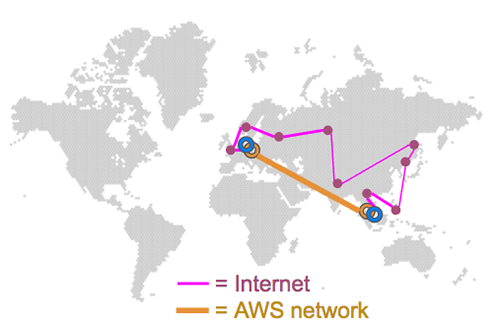 If the distance to connect to Elvis Server is roughly the same as the distance to connect to the Amazon data center, you might be better off connecting without CloudFront (also because all traffic over CloudFront is measured and billed, see 'Costs' below). Because the performance improvement is provided by making use of a different connection, no software changes in Elvis are involved. This means that using CloudFront is fully compatible with all versions of Elvis Server and its client applications. Amazon CloudFront is a service that needs to be paid for. The costs depend on the amount of data traffic and the location of your server and workforce. For a detailed calculation of the monthly costs use the Amazon cost calculator. 1 Either allow public access to your Load Balancer in the Security Group (HTTPS, 0.0.0.0/0), or see the note under Additional configuration about restricting the Security Group of the ELB to only be accessible from CloudFront. Setting up an Amazon CloudFront instance in which the instance of Elvis Server that CloudFront should communicate with is defined. Making sure that users log in to Elvis Server through CloudFront. Step 1. Log in to your Amazon AWS account (create one if you do not have one). Step 2. Open the CloudFront page. Step 3. Click Create Distribution. The Select delivery method page appears. Step 4. In the Web section, click Get Started. The Create Distribution page appears. Note: The settings in bold are crucial to making this feature work correctly. The domain name of the Elvis server instance. Origin ID An optional description for this distribution. Origin SSL Protocols (If applicable) Choose the SSL protocols supported by the server instance. Origin Protocol Policy Choose whether to connect from CloudFront to the server instance over HTTP only, HTTPS only, or by letting the end user decide. Viewer Protocol Policy Select the SSL mode to use. Allowed HTTP Methods Select	GET, HEAD, OPTIONS, PUT, POST, PATCH, DELETE. Query String Forwarding and Caching Select	Forward all, cache based on all. Compress Objects Automatically (Optional) Set to Yes for smaller file transfers. Enter the CNAME when linking a DNS CNAME to the distribution. This allows you to hide the default CloudFront URL. Step 6. Click Create Distribution. the distribution is created. The status for it will appear as 'In Progress' and is ready when the status appears as 'Deployed'. Note: Setting up the distribution or making changes to it takes can take more than half an hour. For those users who need to connect through CloudFront, make sure that they do so via the new URL. This can be easily done by changing the DNS record for your server to the CloudFront distribution; this way users do not have to change the URLs they use. Please take note of the following information for configuring the environment. Elastic Load Balancing (ELB). It is possible to restrict the Security Group of the ELB to only be accessible from CloudFront. Although this is not easy to achieve, it is possible. For more information see the Cloudfront Security Group blogpost on 24hoursmedia.com. Using an Amazon Web Application Firewall (WAF). The use of AWS WAF to secure both ends of the connection (origin and end user) has not been tested by us. When using Elvis Agent for opening files for editing using the Pro client, Elvis Server needs to be configured. See Installing Elvis Agent. 4 July 2018: Added section 'CloudFront limits'.